Law students trash building taken on rent, vanish without paying electricity and maid bills in Mumbai. Shakya Chandra and Suman Mitra, students of Government Law College, Mumbai have allegedly not only trashed the entire apartment and all furniture of the rented apartment they stayed in, before vacating the same but also evaded paying electricity bill running close to 10,000 rupees. As visible from the Facebook status displayed below, Ms. Shivani Kamal Bhasin, daughter of the Apartment owner, shares how the aforementioned students of GLC (who were also staying with two other students) not only trashed her mother’s apartment, refused to pay pending electricity bill and did not pay their maid money but only hosted a “Demolition Party” inviting people via Facebook to come and trash the place. 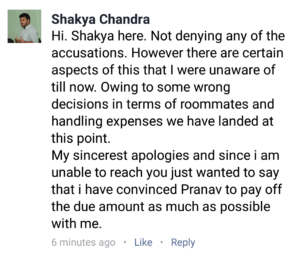 Since this post was published, one of the students Mr. Shakya Chandra has come forward and accepted the accusations and the incident but has claimed that he was unaware of certain aspects of the incidents which had taken place. Mr. Suman Mitra has replied to our queries for comment stating that no house party ever took place on the premises and that he himself was not in Mumbai until a few days before. He informed that he had been told by the house owners to have his stuff removed due to the upcoming demolishing but knew no further of the alleged incident. Editors Note: It is disgraceful that budding Lawyers would have neither the sense or the sensibility to behave like mature responsible individuals and not like spoilt rich kids. The House Owners have repeatedly stated that they do not wish to pursue legal action as they do not want to jeopardize the career of the children involved. We hope that better sense prevails and all the previous occupants not only clear the pending amount but also more importantly apologize. Unfortunately, this incident also reinforces why apartment owners generally do not give bachelors rooms on rent. PS: We are attempting to get in touch with GLC and the students involved in comments. The story will be updated as and when we have their comments if any. « Breaking Taboo: ThatMate announces book to educate on menstrual health and to shatter myths!